A long line dress with double layered fabric for extra strength and shaping. 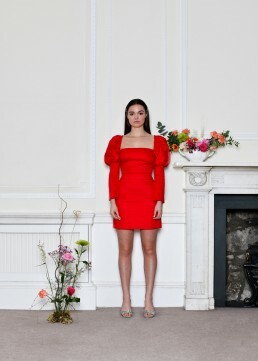 Low scooped neckline with delicately hand pleated puffed sleeves and tie straps at the back for ease of wear. Wide open back detailing, raw hemline with zip fastening at back center. The length of this dress is 39 inches from underneath the armpit.